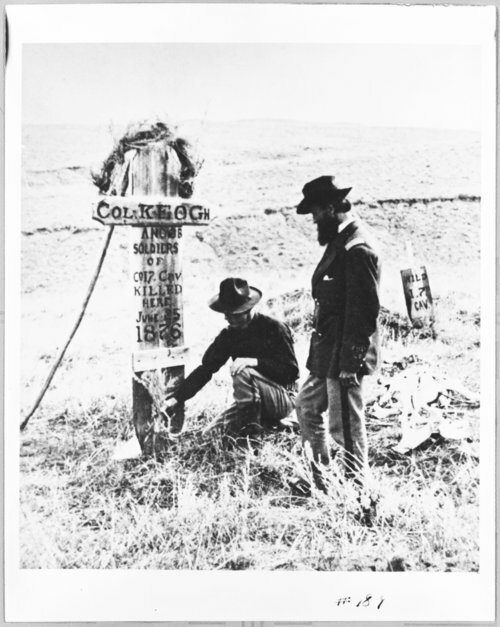 A photograph of two men placing flowers on the grave of Lieutenant Colonel Myles Walter Keogh who served under General George Armstrong Custer in the 7th U. S. Cavalry. Both Keogh and Custer were killed in the Battle of Little Bighorn on June 25, 1876. Funds for digitization provided by Mr. Steve Peckel in memory of William Chalfant.